A few months ago, I was helping test an internal secret Google product: Same Day Delivery service. Since this is a food blog, not a technology or services blog, I won't go into details of the service here, but as part of the testing, I had to order a lot from the merchants available. And since it was early on, my choices were a bit limited: REI or American Eagle (uh, when do I urgently need things from there? ), Staples or Office Depot (when do I EVER need things from there? ), and then the more practical Target and Raley's grocery stores. I grew up in a land without a Target, so this was actually a bit fun for me. 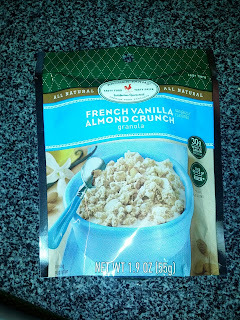 I decided to explore Target's premium house brand, Archer Farms (get it, Archer, Target, ha), as part of my great granola quest. I still haven't found a winner, but I think I liked the Archer Farms stuff more than any of the fancy, expensive, artisnal, etc, etc ones I tried. "A tasty mix of rolled oats, crisp rice, pecans and a touch of cinnamon." Ok, so I bought this because of the name. Who doesn't love pecan sticky buns? 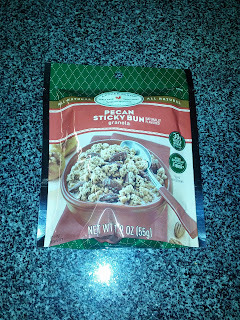 I figured it wouldn't taste anything like a pecan sticky bun, but I was determined to try. I opened the package, and ... it smelt just like a sticky bun. I took my first bite, expecting to be disappointed but instead, I was rewarded with a rather incredible pecan sticky bun flavor. This truly did taste just like one! The granola came in little clusters, not quite big enough to just eat as finger food, which is how I sometimes like my granola. There were plentiful nice sized chunks of flavorful pecans. There was a lot of cinnamon flavor. I enjoyed it with some milk, it didn't get mushy too fast, and the sweetness went well with the milk. Clearly not health food granola, but pretty good, particularly for the price. 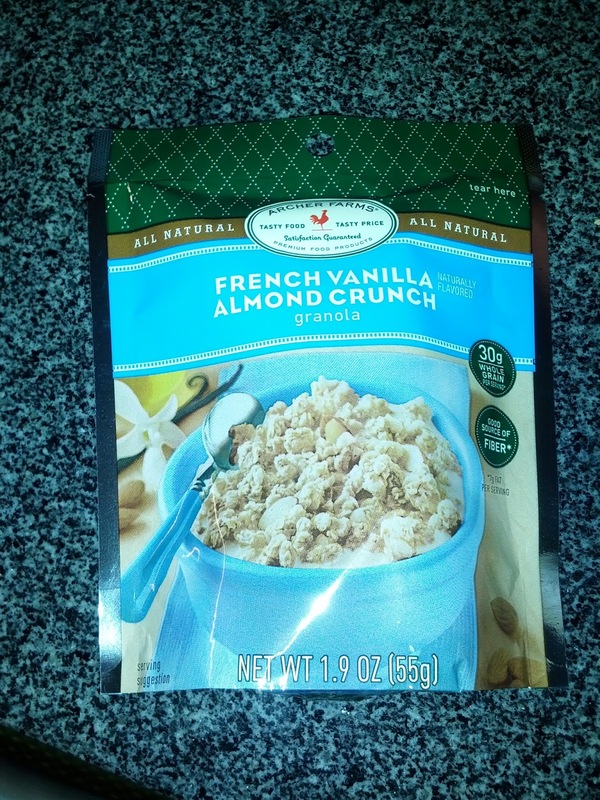 French Vanilla Almond Crunch Granola. Since I enjoyed the Pecan Sticky Bun granola, I decided to try out another one. This one was made with "mixed rolled oats, crisp rice and almonds with vanilla and nutmeg." I didn't like it as much. It seemed to contain a lot of the crisp rice rather than oats, making it seem more like cereal than granola. The vanilla and nutmeg flavors weren't very strong. Like the other variety I tried, the clusters were kinda too small to make it finger food, but it worked better with milk. Not bad, but no real reason to get it again. Black and White Trail Mix. I also was drawn in by their snack foods and mixes. The black and white is a trail mix of peanuts and raisins, each prepared in three ways: plain, with yogurt coating, and with milk chocolate coating. The plain versions were pretty unremarkable, but not bad. The raisins were decently plump, not hard little pellets. The peanuts were roasted and salted. The yogurt versions were very sweet, with a waxy coating that I couldn't really tell was "yogurt" vs "sweet hydrogenated oil". Like the plain versions, they were fairly unremarkable. The raisins ended up just too sweet, but the peanuts weren't bad, a nice mix of sweet and salty. The chocolate coated versions were with milk chocolate, and the peanut and milk chocolate combo is always a good one. But just like the yogurt covered ones, I disliked the raisins. They weren't necessarily too sweet, but I just hated the flavor. Eating this turned into a game of "guess which ones are peanuts and which ones are raisins", since I enjoyed the peanuts, and hated the raisins, the stakes were high! Amusingly, once I finished all the coated peanuts, I decided that the raisins weren't THAT bad, and ended up eating all those too. I wouldn't buy it again, but it ended up being a decent mix. This review has been merged into my master's Noah's post. This is a bit random. The chocolates I review tend to come from a few different sources - chocolate festivals, events at my local chocolate shop, gifts from friends visiting from afar, or, Christmas gifts from my family. This chocolate falls in the later category. Once my family members learned that I was into chocolate, they started filling my stocking with it every year. The problem is, it tends to be not exactly the best chocolate: Hershey, Russel Stover, or if I was really lucky, Lindt. I was surprised to receive a bar I hadn't heard of, as I wasn't familiar with the Nirvana label, and had basically zero expectations for it. It turns out they are a Belgian chocolate maker, making 72% bars with a variety of mix-ins, and are all also organic and vegan. I won't be seeking them out myself, but this wasn't bad. 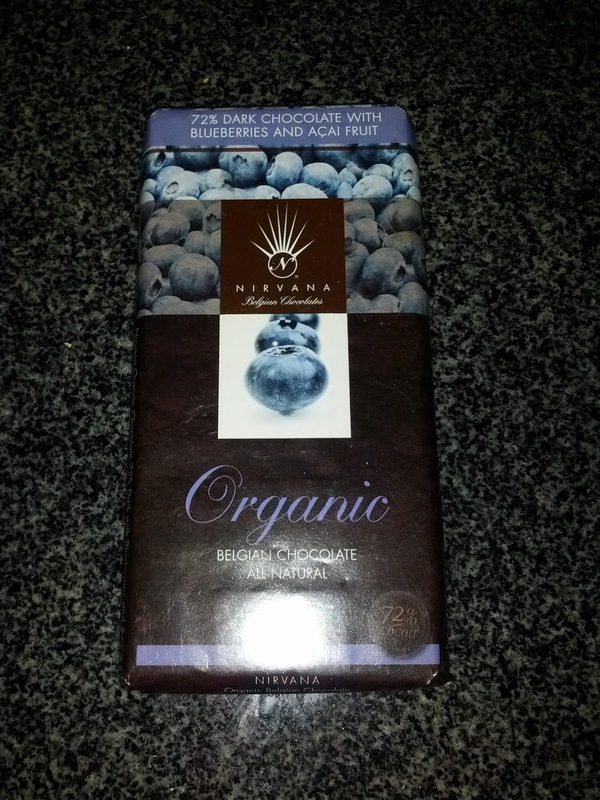 Organic Dark Chocolate with Blueberry and Açai Fruit. Described as "72% cocoa dark Belgian chocolate with blueberry and açai fruit." I expected to find bits of blueberry or açai in the bar, but it was smooth and homogenous. Looking at the ingredients revealed "blueberry flavor" and "açai flavor", which you could pick up on as subtle berry tones perhaps. It seemed very chocolatey tasting for only a 72%. Smooth texture and a nice snap to it. Not bad.